Rumors of its demise have been rampant for months now, and officially the Cheyenne Brewing Company is no more. We were quite excited when they opened their doors early in 2015, but in hindsight, they were in the weeds from the start. I continue to believe that the location on the east end of the Depot is prime real estate for a brewery, but it needs to strike the right balance between restaurant and brewery. Cheyenne Brewing Company never figured out the service end of things. Customers give you one or two shots to make it work and then they go someplace else. Cheyenne continues to be a chain and coupon town, so it makes it difficult to build loyalty. When ticket times run into the 45-60 minute range, people will take their money elsewhere, especially the non-craft beer drinkers. It also never helped CBC that the brewing equipment had been so neglected and disgusting from the previous owners. You can’t brew beer on a broken system. There is no word on a potential replacement for CBC as of yet, so we will just have to wait for Dainelmarks to open up in the near future to go back to a two brewery town. When you tell me that there is a tap selection that numbers north of 50, and you tell me that wild game sausages are among the most popular appetizers, who have caught my attention. Having found the Pourhouse in Loveland a few weeks ago, I had the chance to stop in and try it again over the 4th of July weekend. I love the space that the restaurant occupies. The open bar area gives way to booths and tables in the dining area. Large windows look out on to east 4th st. adding plenty of natural lighting to the space. We sat at a booth and perused the extensive beer menu. The menu is broken down by styles, and it seems like they have just about any kind of beer for any taste. I decided to go with the Demshitz Brown Ale from Bonfire Brewing. It was a nutty, smoky ale, and it reminded me that I too often overlook the brown ales on the menu. We decided to go the app route, as they had a good sampler selection. It featured Fiery Cordon Bleu Pops with Chipotle Aioli. 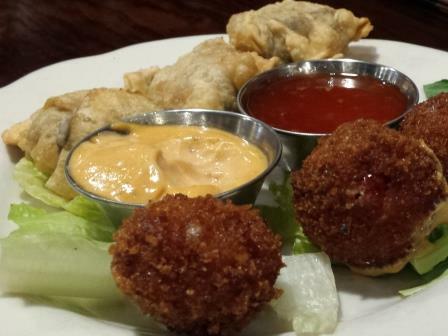 Mushroom Rangoons with Thai Chile sauce, Spinach and Artichoke Dip and Red Pepper Hummus. We ronuded it off with a selection of 1/2 price Mango Habanero wings. All of the apps were outstanding in their flavor combinations. The mushroom rangoons were earthy goodness wrapped in a light puff pastry. The bleu pops were something new and different. Maybe a bit on the over fried side, but when paired with the Chipotle aioli, it made for a great mid afternoon snack. The mango habanero wings were that nice combination of spicy and sweet and were crispy fried just the way I like it. They are too hot for those that like casual heat, as Lorrell couldn’t even eat one wing, but to me they were delicious. I haven’t been to the Pourhouse and experienced the night life aspect there, but the two times I’ve gone, I’ve found it to be a great beer bar with awesome food in a perfect Loveland location. We will definitely be back again. The Capitol Grille in the Historic Plains Hotel in downtown Cheyenne has struggled to find its footing in the downtown dining scene. On one hand they have prime real estate in the heart of downtown and a hotel full of guests many nights, on the other hand, they just can’t seem to find a menu that appeals to both hotel guests and the downtown dining crowd. Take a look in there at lunchtime and you will see an empty restaurant, and dinner is far from that experience either. The Plains has a new general manager in Christian Henny and now he is going to take a shot at injecting some life into the historic spot. The previous general manager was betting that high end steakhouse was the way to go, but with a lack of promotion and competition from the Wyoming’s Rib and Chop House, that concept just didn’t fly. The new menu this time around will focus more on pub fare and comfort food, keeping a price point that makes sense for the lunch time crowd in the day and the “out for a beer and burger” crowd at night. The new menu was rolled out last week and staff from the grill were out spreading the word around downtown. Publicity and asking people to give them another chance are two crucial elements if they are ever going to turn around that spot. I’ve had lunch in there a couple of times in the last six weeks and it is always very good. They just need to find a way to let others know about it too. 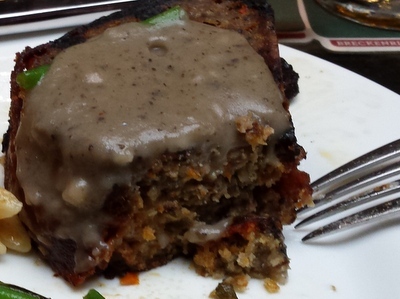 Presented without further comment, the Bacon wrapped Meatloaf with Mushroom Gravy.